This just in... We ran a report on gig requests through GigMasters over the past year, and found that these were the top event categories. We weren’t surprised with the usual suspects, however, it’s worth taking note at some of the others. This reminds us how important it is to consider your audience while promoting your act. We know that’s easier said than done (and much easier for Harpists and Balloon Twisters). But if you want to attract a wide range of clients, be sure to promote any experience you have with playing private events. You can do this in your profile's description, past calendar dates, or even with a video of you performing at one of these types of events. Yeah, we noticed Christmas Party on the list too. Although it's out of season, this shows us that holiday events are very popular. So, start thinking Easter, Memorial Day, 4th of July, and so on. We also found that Corporate Functions had the best booking conversion rate at 23% (weddings are around 15%), which means that more corporate gig requests turned into actual bookings. And just because these events are the most popular, doesn't mean they're the right for your act. 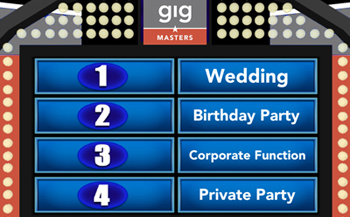 To view the full list of GigMasters' event categories and to manage which ones you're available for, login to your Control Panel. Next, click the "Profile" tab, then "Profile." Scroll down and here you can update your Gigs Desired. This blog is not a one way street -- we know that you’re the real experts on gigging! Please share any advice and keep this conversation going in the comments below.